ATLANTA (AP) — Noting U.S. Rep. John Lewis’ life of “raw courage,” Atlanta officials renamed a street for the civil rights icon Wednesday. Freedom Parkway, a four-lane conduit to the Carter Center, will now be called John Lewis Freedom Parkway. 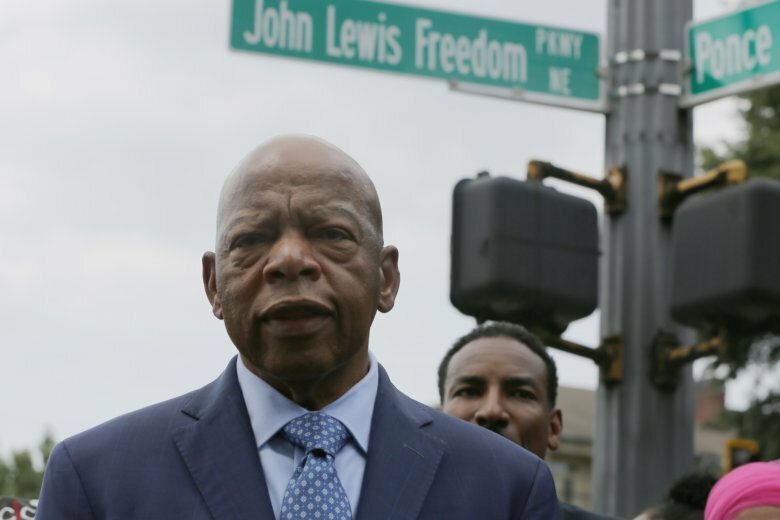 “John Lewis is synonymous with freedom,” Atlanta City Council member Andre Dickens said when explaining why that particular street was chosen. Dickens sponsored the resolution — which the council unanimously approved in December — to rename the street after Lewis. In the 1960s, Lewis spent his adolescence fighting discrimination alongside other civil rights legends like the Rev. Martin Luther King Jr. He was the youngest civil rights leader who worked with King. While in college, Lewis organized lunch counter sit-ins at restaurants in Nashville when he attended Fisk University. At 25, Lewis was beaten badly and suffered a concussion on “Bloody Sunday” while leading hundreds of protesters at Edmund Pettus Bridge in Selma, Alabama. Images of his horrific beating were nationally televised; the brutality forced the country to recognize the discrimination running rampant throughout the South. In 1981, Lewis’ career in politics began with his election to the Atlanta City Council. Just five years later, he was elected to Congress. Renaming the street is just one way the task force assembled by Dickens plans to pay respect to the congressman. Plans to paint a mural of Lewis in the Atlanta airport in January ahead of the Super Bowl are in the works, Dickens said. Mayor Keisha Lance Bottoms also presented Lewis with the Phoenix Award — the city’s highest honor — Wednesday for his work as both a local and national leader.